Funeral Directors and Embalmers in Massachusetts are required to complete 8 hours of continuing education every year, including 1 hour pertaining to OSHA and bloodborne pathogens. The deadline is October 31st every year. 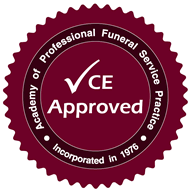 The following courses have been approved by the Massachusetts Board of Embalming and Funeral Service. You must first purchase the course (Click the BUY NOW button to get started). Once you have paid, you will be taken to a receipt page which will has a link to take the final exam online. The link will also be emailed to you. The exam online is identical to the exam in your book.